Ruslan Provodnikov was coming off three high-profile losses over the course of two years. He was 3-3 in his last six fights. John Molina Jr. was coming off three high-profile losses in the span of one year. He was just 1-4 in his last five. Two things were expected out of Provonikov vs. Molina: for the fight to be fun while it lasted, and for the fight to end with Provodnikov the winner. That’s because Provodnikov’s losses came in highly competitive bouts: a war with Tim Bradley, a close affair with Chris Algieri, and a battle with Lucas Matthysse. Molina had given Matthysse hell in 2014 before getting broken down and stopped, but then he’d looked as if he had little left in decision losses to Humberto Soto and Adrien Broner in 2015. Molina showed Saturday that he isn’t yet done. He exchanged punches with Provodnikov, though not more than he needed to. Instead, he boxed between exchanges, using both his movement and a wealth of activity (nearly 1,100 punches thrown by him in total) to take control of the action, take rounds on the scorecards and prevent Provodnikov from breaking him down. The judges had it 117-111 (nine rounds to three), 116-112 (eight rounds to four) and 115-113 (seven rounds to five), giving Molina the unanimous decision. Molina improved to 29-6 with 23 knockouts. The 140-pound division isn’t as deep as it once was, but perhaps he may end up soon with Rances Barthelemy, who won titles at 130 and 135 and is now moving up to junior welterweight. Provodnikov dropped to 25-5 with 18 KOs. This was not his best performance, which may be because he had an off night, or because he’s beginning to decline, or because Molina used a good strategy to deal with Provodnikov’s tough but limited style. Or maybe it’s some combination of the above. No matter the reason, he should still be back in a notable fight soon. After all, he’s still fun to watch — win or lose. There are several young fighters who believe they are the best of the 154-pound division. 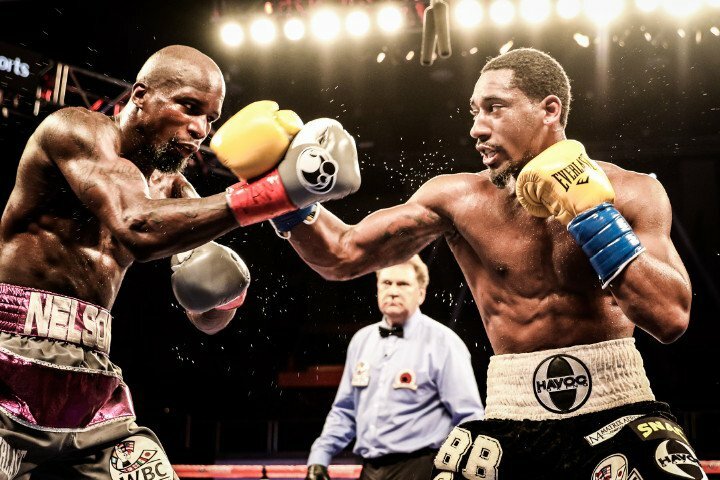 Demetrius Andrade thinks he was once among them before and belongs among them again. He’s ready to prove it. He certainly looked ready on Saturday, when he defeated Willie Nelson with a technical knockout in the 12th round. Andrade scored early, putting Nelson down in the first round. Andrade had hurt Nelson with a left hand. Nelson tried to fire back with a left hand but missed. Andrade responded with a right hook, flooring Nelson. It was the sixth time in Nelson’s career that he’d been down. He’d gotten up to win fights before. That’s not what happened this time. Instead, he visited the canvas on three more occasions. Nelson at least stabilized himself for much of the fight. He couldn’t stop Andrade from using movement and combinations to dominate the bout, though. That punishment added up. Andrade dropped Nelson again in the 11th and twice more in the final round, giving the referee good reason to step in and end things early. Andrade is now 23-0 with 16 KOs. He used to hold a world title but was stripped of it for inactivity. He’s in line for another title shot, however. This victory gave him a mandatory shot at the winner of an upcoming fight between titleholder Jermell Charlo and Charles Hatley. Nelson is now 25-3-1 with 15 KOs. It was the weekend of the annual Puerto Rican Day Parade in New York City, and as is often the case there was boxing in the Big Apple with fighters from the island playing a starring role. But while lightweight prospect Felix Verdejo could celebrate after stopping Juan Jose Martinez in five rounds on the undercard, this didn’t wind up being a festive weekend for 130-pound titleholder Roman Martinez. That’s because Martinez ended the night flat on his back, listening as the referee counted to 10. The person who put Martinez there was Vasyl Lomachenko of Ukraine, who was considered one of the best amateur boxers ever and has quickly garnered quite a reputation as a pro. Lomachenko won gold in the Olympics in 2008 and again in 2012. He challenged for a world title in the 126-pound division in just his second pro fight — if you don’t include the six bouts he had in the semi-pro World Series of Boxing before joining the paid ranks in earnest. Lomachenko then won a title belt in his third fight and defended it with three consecutive victories. Unable to get fights made with other top featherweights, he moved up to the 130-pound weight class and challenged Martinez. It didn’t turn out to be much of a challenge. Lomachenko’s superior hand and foot speed was evident from the outset. He landed with accuracy, hitting Martinez with 43 percent of what he threw, including nearly 58 percent of his power shots. A pair of those power shots — hard, southpaw left hands — sent Martinez back to the ropes in the opening minute of the fifth round. Martinez tried to duck under Lomachenko and get away, but Lomachenko turned, threw a left uppercut and followed with a right hook. Martinez dropped hard. He was too dazed to rise. Lomachenko, who is now 6-1 with 4 KOs, will most likely stay at 130 and give up his world title at 126. One fight he’s interested in at junior lightweight is a rematch with Orlando Salido, who gave Lomachenko his sole pro loss back in 2014. Salido came in overweight for that fight, gained additional pounds by fight night and had a size advantage in the ring. He also got away with numerous low blows. Even still, Lomachenko was competitive in what turned out to be a close split-decision defeat. Salido is coming off a draw with 130-pound titleholder Francisco Vargas in what so far is the leading candidate for this year’s best fight. Martinez is now 29-3-3 with 17 KOs. Lomachenko wasn’t the only two-time gold medalist fighting in Madison Square Garden this past Saturday. There also was Zou Shiming of China, who was the best of his division in the 2008 and 2012 Olympics. Shiming, like Lomachenko, has a loss on his pro record. But unlike Lomachenko, he’s not yet won a world title of his own. Shiming lost in a title shot against Amnat Ruenroeng in early 2015. He returned this past January with a victory. Last weekend’s decision win over Jozsef Ajtai makes two in a row. Shiming is now 8-1 with 2 KOs. His trainer, the famed Freddie Roach, said afterward that there could soon be a fight with Juan Francisco Estrada, a very good fighter who holds two world titles at 112 pounds.